Almost everyone in Indiana has seen or at least smelled a skunk. No one wants these little critters under their home. One of our past customers customer said he would shoot the skunk if he could find it. That was a BAD IDEA! 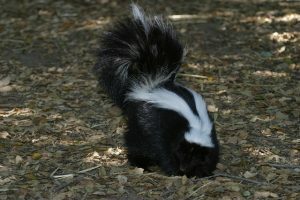 When a skunk sprays, approximately 10 percent of its’ “perfume” is released from a special gland in the rear of the skunk. When a skunk dies or is killed, all of it comes out. That is why a road kill skunk can often be smelled for miles. Skunks usually mate in January. Babies are born in April or May. Skunks do most of their traveling and hunting for food at night. They may travel a couple of miles an evening. Skunks may also have more than one place they call home. A skunk may nest under your patio deck one night and under someone elses shed the next. Then they may return to your patio deck a night or two later. Skunks generally eat insects and small rodents if they can catch them. The may also eat crayfish (crawdads) if they can find them. Skunks are known for ruining greens on golf courses as they gouge out many small holes digging for worms or grubbs. Skunks in Indiana are usually 2 to 5 pounds although they may look bigger due to long fur. A few skunks may reach 8 to 10 pounds.